Frequently, the focus of cosmetic improvement is the face, yet one of the most often neglected, age-telling features is actually the hands, despite the fact that they more often can reveal our true age. Our hands tend to be one of the first areas to show signs of aging, partly due to sun exposure and the natural aging process, and because we use them constantly. Because the skin on the back the hands is extremely thin, the loss of natural fatty tissue as we age will readily reveal wrinkles, skin laxity and even underlying structures such as veins and tendons, making you look older than you really are. Over-the-counter hand creams might make your hands feel softer, but they are unlikely to provide any significant improvement in appearance. Cosmetic hand rejuvenation treatment or “Hand Lift” can result in a big improvement in the appearance of aging hands and restore a younger, refreshed look. Who is a Candidate for Non-Surgical Hand Rejuvenation? How is Non-Surgical Hand Rejuvenation Performed? In individuals who have noticed a loss of soft tissue fullness in their hands, replacement of this soft tissue using dermal fillers will help restore a more youthful appearance. 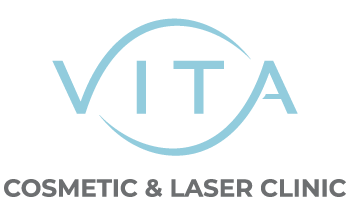 At Vita Cosmetic and Laser Clinic we use a number of treatments and procedures to address your specific issues. For non-surgical hand rejuvenation, we use soft tissue dermal fillers, laser skin rejuvenation and topical cosmetic skin care products to restore volume to your hands and improve skin texture, tone, and overall appearance. Typically, the procedure can be completed within 30 minutes, depending on the extent of injections required. Prior to the start of the procedure, the area is usually injected with an anesthetic such as Lidocaine to minimize pain, Injections are made in the spaces between the fingers using a very fine needle. Your hands will then be massaged to evenly spread and distribute the filler. After the procedure, cold packs will be applied to your hands, to aid in healing. The results will be evident immediately, and will typically last for a minimum of six months. Before receiving dermal filler injections, the patient will have a skin test to determine any potential allergies to the treatment. The test is usually done with adequate time before the first round of injections to ensure the patient can safely undergo the procedure. The patient should keep a watchful eye on the test site for any indications of redness, itching, swelling or other potential reactions. If any of these occur, the patient should contact our clinic immediately. The dermal filler injections themselves are typically performed quickly, and usually last around 30 minutes to an hour. The Nurse Injector will inject the cosmetic filler at several points along the area to be treated, just beneath the skin surface. Hand rejuvenation procedures do not have permanent results. The body eventually begins to absorb the dermal filler, so follow-up treatments are necessary to maintain results over time. Dermal filler injections are an ideal solution for those who are seeking an effective, convenient procedure, with minimum pain and quick recovery time. The results of hand injections will vary from person to person; however, most patients report noticing that around half the fullness in their hands begins to subside approximately six months after treatment. To maintain visible results over time, repeated treatments are necessary. Without continued follow-up treatments, the appearance of the hands will gradually revert to their original condition before the first procedure. Results from hand injections are immediately apparent, will usually last from three months to one year, and injections can be repeated when desired. Patients with a history of impaired healing, diabetes, ongoing sun exposure or smoking may see a less dramatic initial result and the effects may not be as long-lasting. Your hands may appear puffy or slightly swollen for a few days after the rejuvenation procedure, and you may experience a little mild stinging or throbbing in the injected areas, but this is normal and only temporary. The downtime and recovery period are minimal, and people who undergo dermal filler injections for hand rejuvenation can go back to their normal daily routine very soon after treatment. To help ensure a quick recovery, be sure to follow your clinician’s post-op care instructions. It is important if you are considering a hand rejuvenation treatment that you consult with one of our qualified and experienced clinicians for more information about your specific needs and expectations. Your initial consultation will take about an hour, during which time your clinician will review the pertinent information and discuss all of the non-surgical options relevant to you.